Goldman Sachs’ David Kostin believes a temporary pullback may explain why the S&P 500 has tumbled from its all-time high of 2,019 on Sept. 19. Notice how the bulk of buybacks are concentrated in the fourth quarter, with the obvious intent of goosing prices at year end so as to lead to higher executive pay for “increasing shareholder value”? In fact, these companies are being gradually liquidated. Issuing debt, which public companies have done in copious volumes since the crash, and using it to buy shares is dissipating corporate assets. They are over time shrinking their businesses. That is also reflected in aggressive headcount cuts and cost-saving measures. Even though analysts like to tout the cash that companies have sitting on their balance sheets as a source of potential investment, as we’ve discussed in previous posts, public companies are so terrified of even a quarterly blip in earnings due to incurring expenses relating to long-term investments that they’d rather do nothing, or go the inertial path of cutting costs to show higher profits. There is a close relationship between changes in the value of the stock market and changes in the unemployment rate one quarter later. My research here, and here shows that a persistent 10% drop in the real value of the stock market is followed by a persistent 3% increase in the unemployment rate. The important word here is persistent. If the market drops 10% on Tuesday and recovers again a week later, (not an unusual movement in a volatile market), there will be no impact on the real economy. For a market panic to have real effects on Main Street it must be sustained for at least three months. Yves here. The problem is that correlation is not causation. Significant and sustained stock market declines are almost always the result of Fed tightening. The usual lag between an interest rate cycle turn and a stock market peak historically was roughly four months, but in our new normal of seemingly permanent heavy-duty central bank meddling, old rules of thumb are to be used with great caution. Nevertheless, Greenspan was obsessed with what drove stock prices, and the Fed is unduly solicitous of asset price levels, no doubt because people like Janet Yellen have to leave their DC bubble in order to meet actual unemployed people. For those readers who still think that the Fed doesn’t meddle in the markets: Think again. Friday’s stock surge had nothing to do with productivity, price, earnings, growth or any of the other so called fundamentals. It was all about manipulation; telling people what they want to hear, so they do exactly what you want them to do. The pundits calls this jawboning, and the Fed has turned it into an art-form. All [St. Louis Fed President James] Bullard did was assure investors that the Fed “has their back”, and , sure enough, another wild spending spree ensued. One can only imagine the backslapping and high-fives that broke out at the Central Bank following this latest flimflam…. It’s too bad the Fed can’t put in a good word for the real economy while they’re at it. But, oh, I forgot that the real economy is stuffed with working stiffs who don’t warrant the same kind of treatment as the esteemed supermen who trade stocks for a living. Besides, the Fed doesn’t give a rip about the real economy. If it did, it would have loaded up on infrastructure bonds instead of funky mortgage backed securities (MBS). The difference between the two is pretty stark: Infrastructure bonds put people to work, circulate money, boost economic activity, and strengthen growth. In contrast, MBS purchases help to fatten the bank accounts of the fraudsters who created the financial crisis while doing bupkis for the economy. Guess who the Fed chose to help out? “I want to remind readers of a message that may be buried in the past: When QE1 ended, the S&P 500 fell just under 20% in a roughly three-month period before the QE2 recovery. Is that why the Fed started jawboning QE4, to avoid the inevitable 20 percent correction? Whitney continues with one of our favorite tropes: that all QE has done is elevate asset prices. That has not led to a recovery in anything much beyond the balance sheets of the top cohorts and the income of the top 1%. Even worse, it has provide cover for the Administration falling in with investor-favoring austerity, in the form of reducing deficit spending when it ought to be increasing it to take up the considerable and costly slack in the economy. It’s not surprising to see the Fed double down on a failed strategy. The central bank had apparently finally recognized in 2013 that QE was not helping the real economy, and they needed to exit the policy to reduce the resulting economic distortions. But they lost their nerve during last summer’s taper tantrum, and turned cowardly again in response to a mere stock market hissy fit. This entry was posted in Doomsday scenarios, Economic fundamentals, Federal Reserve, Free markets and their discontents, Investment outlook on October 21, 2014 by Yves Smith. Ability to cost debt but not equity (as in deduct interest on loans from profits but not dividends) will, I believe, after the current cheap-debt spree, be the cause of a number of corporate failures in the future. CBs continue to believe (or at least profess) that cheap debt spurs real activity. It doesn’t. As you Yves wrote a number of times, cost of debt can sink a projec, but it will not initiate it – there’s cost and there’s profits sides of a project. The former can sink it, but only the (possibility of) latter will lift it. All cheap cash will do is creates incentives for “financial engineering” ala buybacks, paying dividends with debt secured against (untaxe) offshore cash etc. etc. A commenter on some article about the swedes a few days ago was arguing that free money via QE is a cause of deflation. The idea is that QE allows crappy companies that would normally go out of business at current price levels to survive. I took Econ 101 in 1961. At the time a lot of people still had personal memories of the Depression. When we got to the macro section of the course, one of the things the instructor emphasized, and I think Samuelson (whose textbook we were using) also emphasized, interest rates are fine for reining in an overheated economy, but one thing we learned from the 1930s was that you can’t push on a string. Why has this insight been forgotten? There are people who have paid a lot for propaganda to make sure that this insight is forgotten. Why they want the Great Depression back again, that’s a harder question, though I have some ideas. This stuff is the equivalent of taking a critically-ill patient’s medical chart and loading it with phony data which would make it appear as though his health is improving–as though reality has to conform to what the chart’s data show. And, rightly understood, this is simply another form of what amounts to “bubble” phenomena–which is nothing more than a market which exhibits a vibrancy which is based on false or misleading indicators and the erroneous investor expectations they engender. When that’s done in a deliberate and systematic manner, it deserves to be described as, yes, market manipulation and, I think, fraud. I suspect that such fraud is going on all over the place–anywhere inegnious people see an opportunity to mislead others’ accurate appreciations of the markets’ activity. So, e.g., when a broker talks up (or down) some company’s stock, he can easily be involved in a bogus effort to manipulate trading in way that serves his company’s interests rather than the investor audience. Of course, it’s all so much grist for high-speed programmed trading concerns which don’t care what the bases of human investor-chumps’ trades may happen to be. It’s a wonder anybody plays in this crooked casino. Welcome to Joe’s almost slightly honest casino and gambling emporium. Federal Reserve 40-year mantra: When profits rise it’s growth, when wages rise it’s inflation. The old Fed guard, the ones that are unseen but as powerful as the chief because they enjoy tenure and are unaccountable, work for the banksters not for Average Joe. Keeping wages depressed was and is policy. When profits rise it’s growth, when wages rise it’s inflation. The Fed has, it would appear, permanently stamped out “inflation”. I wish I could upvote that. They have most certainly stamped out inflation, and completely by design. There’s a certain [perhaps unavoidable?] convenience in this legal restriction, isn’t there? Since the buy-backs are (temporarily) prohibited, not only do other investors know when to wait for a bargain-price–under the circumstances as described above–the company itself finds that, absent its former price-propping actions in the market, it can arrange to resume buy-backs at a lower price than was theretofore available. I found this during an NC rabbit hole journey, and is worth repeating. Shares are a long term instrument analogous to a variable coupon 50-60 year bond. Central Bank cash-splash in the short term makes no difference to the VALUE of a share today. But their operations (all this “whatever it takes” puff) have created the recent illusion that they have the power to refashion reality as they choose, in a long term sense. This is “new normal” nonsense. Buyers think they’re sagely buying VALUE. They’re just paying today’s price, and that price is currently based on belief in the permanent effect of an unsustainable external interference. Frankly, we are so far off the economic rails, the locomotive is stuck in a swamp, and the trailing cars are piling up around it. The other day, Yves told us “never never never trust a financial salesman”. I consider the Fed a financial salesman. They lie to our faces repeatedly, are grossly incompetent and criminally complicit in the ongoing economic destruction. Yellen jawboning with poor people to get an understanding of their plight is street theater. Fire every economist at the Fed. That would get them some understanding in a hurry. That share buybacks, done with cheaply borrowed money on the name of the corporation, with the goal of enriching the top managers, are the biggest demand in the equities market is a stay the hell away sign for everyone else. The cherry on top is that the interest expense for those borrowings are tax deductible. What a stupid system. And in related news this morning, The Fed has officially repealed gravity. Citizens are encouraged to levitate freely in order to keep up with their money. There is a sad irony to the Fed’s ‘heroic efforts’ to save the system: they may actually be hastening the day when it entirely blows up. Not exactly. What the Fed is actually doing is ensuring that the blowup is going to be *bigger* and *nastier* when it does happen. Stock buybacks can be blamed on the nationwide boom-bust cycle the government-subsidized banks cause and the resulting “dearth of investment opportunities” (Keynes) during the bust. Stock buybacks make perfect sense for shareholders especially if the stock price can be driven up by the company’s access to artificially cheap credit. So the Fed’s attempt to fuel a supply side or wealth effect recovery shoots itself in the foot since it’s consumers and debtors that need relief, not business and the already well off. The PTB should note that only 1/3 of US soldiers would fire on US citizens and those 1/3 would likely be mowed down themselves by the remaining 2/3 so they had best give justice and peace a chance, for their Earthly survival chances, not to mention the Hearafter. I find it interesting that everyone references the fed as some nameless, faceless, ever-present, evil entity as if it is verboten to put names and faces to the malfeasance. That way we never have to address the real issue we can just keep reporting on and bitching about all of the symptoms of “It’s actions. One problem is that scalps of scapegoats get entirely too much hullaballoo for their practical effect because of cowboy culture (approximately, hero worship + American Exceptionalism). Just like Mexican drug lords and Doritos, crunch all you want — there’s more on the way. This is what institutional rot looks like. Another problem is that citizens have no threats against state actors that are both legal and effective. Anything effective has been defined as improper or illegal; anything legal is ineffective at changing behavior. They’re going to act in their own interests until their ability to do so has been removed. The smart move seems to be to divest from the West to the greatest extent possible. It was once “illegal” to advocate for democracy in the UK. Happened anyway. In fact, these companies are being gradually liquidated. Issuing debt, which public companies have done in copious volumes since the crash, and using it to buy shares is dissipating corporate assets. They are over time shrinking their businesses. That is also reflected in aggressive headcount cuts and cost-saving measures. Thanks for highlighting this point. I would argue that the real US economy has been in semi-liquidation since the 80s. For a long time, this was not so overt because companies continued to acquire other companies and so appeared to be “growing” even as acquisitions invariably become consolidations. But now there is little of value left to buy, at least in the US, so even the corporations themselves are shrinking. But now there is little of value left to buy, at least in the US, so even the corporations themselves are shrinking. Right you are. What little is left is grabbed by PE with the assistance of taxpayer dollars in the form of wages and benefits of public sector unions, only to be crapified and have what wealth was there extracted by PE. The entire financial system is rotten beyond redemption. I’m wondering if one our elite will ever connect the dots to the liquidation and hollowing out of the country. Joe & Jane Sixpack know they are being screwed somehow, but don’t know who to blame or what to do because our idiot media focuses on EBOLA or ABORTION or GAY MARRIAGE or some other non issue. The crapification has indeed been going on for a long time, but all things that can’t continue indefinitely, stock buybacks, cough, won’t. Stock buybacks as the biggest “customer” of the stock market seems to suggest insanity. The CEO’s that benefit from this, determined that financial engineering is more profitable and easier than actual engineering, and have figured out a way to game the system to such an extent that calling it capitalism would be blasphemy. I am having a hard time seeing how this system can self correct when the most egregious financial crime wave humanity has ever witnessed is brushed off by the cops as “rocket science” and too smart for them to understand. Really? Same cop then gets a “jawb” in the financial sector making what 2 million per year to be a “liar by principle” financial salesman? Every one of them should be fired for justice’s sake. I wonder if China will sell us some pitchforks at a discount. Don’t they already do that? I do see the possibility that there could be a pitchfork shortage, as China consumes them internally. Well, in my ongoing education in all things finance-and-econ related, I had my mind blown yesterday at David Stockman’s site, wherein he explained how the mighty IBM has basically been hollowed out by cheap money for dumb M&A, lack of R&D (which is related to cheap money for dumb M&A), and more cheap money to goose stock prices for execs. It synchs precisely with what Yves has been saying here for awhile, but it’s taking me a fair bit of time to get the hang of it all. Honestly, I think the Mad Hatter or the Red Queen would have caught on faster; they expect things to be inside-out-and-upside-down. More and more, I believe that the people at the Fed are probably basically pretty decent folks, but they simply have too much academic experience, and far, far too little time in the markets. They probably mean well, but I don’t think they have any true grasp of what’s actually going on in finance and in the so-called ‘markets’ (which at this point, are mostly bot-and-algo operations). Re: the Fed, and my hunch they’re probably fundamentally decent people. From a small perch in regional government some years ago, the dynamic that I watched over, and over, and over was ‘business’ walking all over the government employees. Business was more aggressive, claimed to be ‘the funder’ of all things government (including, it was heavily implied, the paychecks of the government peons), and consequently business required deference. The government employees became suppliants to the whims of the aggressive, ‘bottom-line’ driven, short-sighted ambitions of people whose sole goal was to make money – and as much of it as they could grab, as fast as possible. If I had a magic wand, I’d give The Fed a spine and some guts. In my experience, government types tend to be nice people and so they are far, far too ‘nice’ and deferential to predators, jerks, narcissists, and criminals. And since the rest of us are counting on the ‘nice’ government types to protect our interests, we get hosed. Then we get furious. And now, we truly have a severe crisis in government legitimacy. The slagging economy is at least as much symptom of bad governance as it is cause: it’s a toxic doom loop. This is what was great about FDR. He was nice, but he also had the killer instinct. A nice guy, but if you tried to screw with him, he would destroy you. While grinning a giant grin. Look at the inauguration photos of him and Hoover. He is just loving it. Hoover is… sour. More and more, I believe that the people at the Fed are probably basically pretty decent folks, but they simply have too much academic experience, and far, far too little time in the markets. A lot of decent folks lost a lot due to the GFC. What is it with economists? They call the shots, get it wrong and still call the shots. Where did I say that they shouldn’t be fired? I was simply trying to point out that they are probably well-intentioned, most likely decent people. That does not equate to qualifying for lifetime employment. Plenty of decent, hardworking people lose their jobs; economists should not be immune to this reality. It’s pretty clear that there is a huge disconnect between the Fed, theory, and the way the world is actually functioning today. As far as I’m concerned, if life were fair, then Alan Greenspan would live the rest of his life as a penniless indigent. Thanks for pointing this out, it also jumped out at me in one of the better posts I have seen at this site. It also matches what I kept seeing during the end of my credit analyst years. Many if not most American companies have been slowly winding up their businesses. They have been cutting their workforce, buying back their stocks, and the owners and CEOs have been extracting equity. Also consistent with this is the refusal to invest, even when flush with cash, and the fact that the only population segment where labor force participation has been increasing has been people in their 50s and 60s, while its increasingly difficult for college graduates in their 20s to find work. Companies are not taking in or training young workers, since there is no point as they don’t expect to be in business much longer. Another point of evidence in favor of the doomer perspective. I agree and have seen it in person. In my industry, training, if you can call it that, has pretty much evaporated. Instead, you’ve got a bunch of disillusioned, but overextended 50 somethings settling for a job they would have laughed at 15 years ago. Keep the pressure on the geezers long enough and they’ll eventually drop and you can replace them with even cheaper 40 somethings. We’ll never hire the 20 somethings as I expect we’ll go to contract employees or temps before that route. I’m planning on finally getting started on my beehive this winter. My brother has already begun and he’s going to help me get started too. I’m not a doomer, but a little more self sufficiency can’t be a bad thing. Buy high, sell low. I was reading about IBM yesterday, over several years putting 125 percent of profits into stock buybacks and dividends, financed by debt. They are buying back stock at the top of the market, knowing the market is overvalued, but they are doing it anyway. I think it’s goofy, but chalk it up as another of the perverse incentives of ZIRP and the tax code, blowing a corporate debt bubble. If you’re trying to take the company private, you may have to buy high. Hmmm. all QE has done is elevate asset prices. That has not led to a recovery in anything much beyond the balance sheets of the top cohorts and the income of the top 1%. So everything is going according to plan then. Where’s the problem? The Fed believes that what is good for the wealthy is good for the US, and that when they are in danger of suffering financially, the central bank should break glass and administer monetary relief. The Fed believes that what’s good for the wealthy is good for THEM because they ARE the wealthy. Where’s the surprise? Interesting point about liquidating companies with debt. This is the same strategy we see with loot ‘n scoot shops like Bain Capital and Carl Icahn, among others. Grabbing a company, selling off its assets, and running off with the cash under a cloud of MBA rhetoric accounts for a large percentage of M & A activity. However, instead of a bunch of pirates in ties, it’s the company’s own senior management. Looters use absurd management fees and wonky bookkeeping to create the illusion of a company headed to bankruptcy. The senior management can do the same thing directly. Whether feckless or fraudulent, if you run something you can run it into the ground. I guess the real economy isn’t exciting enough. Running a going concern must be a dweeb thing. Some firms are confused by causation (or are manipulators…). Historically, shares of companies which repurchase end up outperforming in the intermediate future. The buyback does not cause the outperformance, it is merely a signal that the company’s shares are undervalued. Fed policy: A rising tide lifts all super-yachts. This is the history of the world in one partial sentence. One of history’s ironies is that the justification for the financial markets used to be that they were a way for new businesses, and established businesses interested in expanding operations, to raise capital. Now they are being used for owners of shrinking and failing businesses to extract capital, and to keep these businesses alive long enough to do that. NYT DealBook has outed IBM for stock manipulation but they ignore the fact that the practice is ubiquitous. 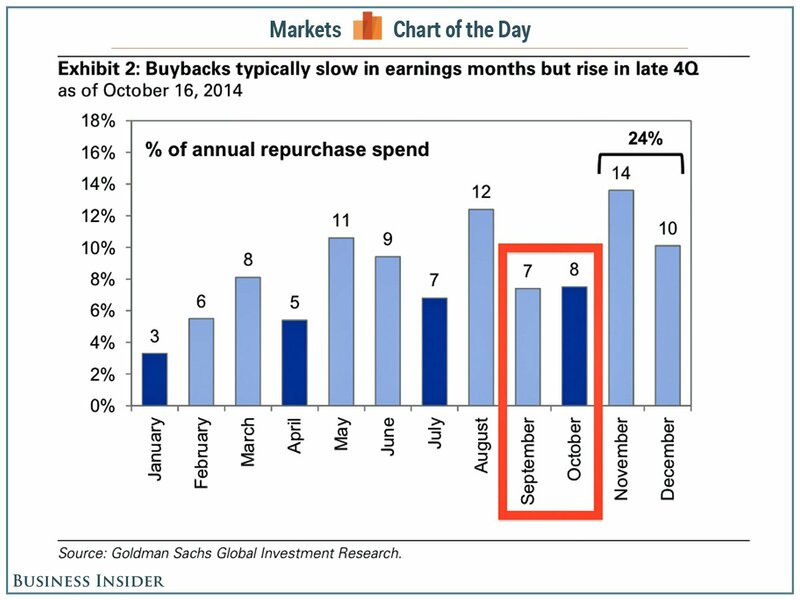 Who isn’t doing buybacks would be news. It’s the reason I dont put money in a corrupt system, wall street is not main street! Unbridled Greed! We are all going to pay , not just the 80 % but now the upper 20 will be tagged with a huge unexpected haircut! Thanks yves for you many hours of research , but I believe we would have been better off with jubilee the lawyers artists ect would not have obtained our lands permenantly ! Now who in their right mind will bail them out this next unavoidable time! We are going to lose our “United” in the United states! or worse ! This isn’t scientific, but saw headlines for bad earning from McDonald’s and Coca Cola, and good earnings from….can’t recall who….and the market is up strongly. Not especially encouraging news for markets to be so happy. So investors cannot correctly analyze capital structure? I find that hard to believe. As long as leverage isn’t too high, one expects increasing debt-to-equity ratios to increase stock prices and market capitalization. Why is the timing of those purchases a problem, even if it allows insiders to better extract wealth for themselves – investors can see the purchases and value stocks accordingly. I really an not understanding what the “market manipulation” is in this case. What other factor might be driving this pattern, e.g. availability of funds for bond purchases?